The 2010 Alpine Fest Parade is now history and what a glorious day for a parade. The streets were lined with people and Mother Nature cooperated with sunny skies and low humidity. This year, the folks at the Lake Zurich Lion's Club enacted a change-up with parade rules as they relate to political entries. Their rationale, or so they say, was to limit the size of the parade in order not to have to keep major thorough fares closed for longer than necessary. Political Entries were by invitation only! ELECTED Officials that represented Lake Zurich were allowed to have: themselves, a car, and one passenger to deliver candy. No campaign literatures, No campaign promotional material whatsoever, that is unless they made a $500.00 donation to the Lake Zurich Lion's Club. 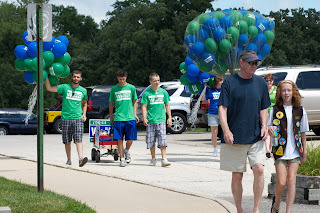 Candidates for offices that represented Lake Zurich were not invited according to the Lion's Club webpage and Parade Rules found at http://www.lzlions.org/events/alpinefest/paraderules.htm. In addition to these new rules, only one entrant per political party was allowed. The Eight District Dems and Independent followed the rules with a car, driver, passenger and candy as did the Lake County Republican Sheriff, Clerk, Superintendent of Schools and Treasurer with a truck/trailer. Now who didn't follow the rules???? Well you could say the Ela Township Republicans by virtue of having elected Precinct Committeemen could have been in the parade, but it is what that group did that caught the eye of many parade goers, Lion's Officials and other entrants who followed the rules. The Ela Township Republicans bucked the rules, and moved out of the political entrants staging area (F) and took a spot all the way upfront in (B). OK so home turf, we could let that slide, but wait there is more.....numerous Joe Walsh walkers (remember no walkers this year) showed up and Joe himself snuck in the back way to avoid the check-in process. Why...because as a candidate, he wasn't invited. Did Joe donate $500.00 to the Lion's Club.....only his D2s will tell, but given his history for paying up. Eye doubts it! But wait there is more...Diane Winter, Candidate for the 5th Sub-Circuit Court and currently an appointed judge (not for Lake Zurich) and now seeking election as a Republican Judge completely blew off the rules. She showed up with campaign signs, handed out campaign balloons and certainly, had no car, but a cute wagon and more than permitted amount of walkers which you remember is none! Her D2s will also be checked for a $500 dollar donation to the Lake Zurich Lion's Club. 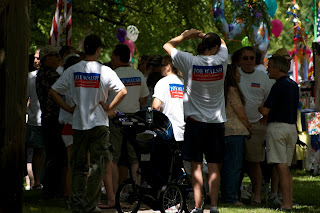 The Parade Coordinator was questioned about all of these rule breakers and their response was "They know the rules, I can't make them abide by them"
So it appears that the "Rules Don't Apply to Me" mentality have taken a front row in the vision for these two Republican Candidates, one of whom is deeply entrenched in the Tea Party. Another observation, the Walsh Walkers are just plain rude. We understand we have differences, but these supporters want to jam their views down your throat. Save it for the Walsh rallies not public parades that are meant for family. Now should this Eye Blogger hear back from any of these campaigns, saying they were 'invited" by the Lake Zurich Lion's Club, then a public apology will be issued and we will look at a violation of one of the "core purposes" of the Lion's Club of not engaging in partisan politics. The Eye knows many candidates up for election in November who were not invited to this parade. Should we expect anything less from Joe and his minions? This is nothing new, I am surprised the D's fell for it this time. So Anon 6:34, are you saying it is ok to break the rules? and yes this something new. 2010 is the first year the LZ Lion's posted the rules. Oh Dear! In the Highland Park 4th of July Parade, Dan Seals jumped the line and broke those parade rules and instead of marching towards the rear of the parade, moved up twenty notches and marched with someone else. No scathing Lake County Eye report was ever published! That is because the Eye wasn't at the Highlan Park Parade. However if there were rules and Seals broke them, then I am sure TA would have been all over that. DMAC57, I haven't followed your blog long enough to know which way you and BB swing, but apparently it's NOT in the direction of Republicans and Tea Party candidates. 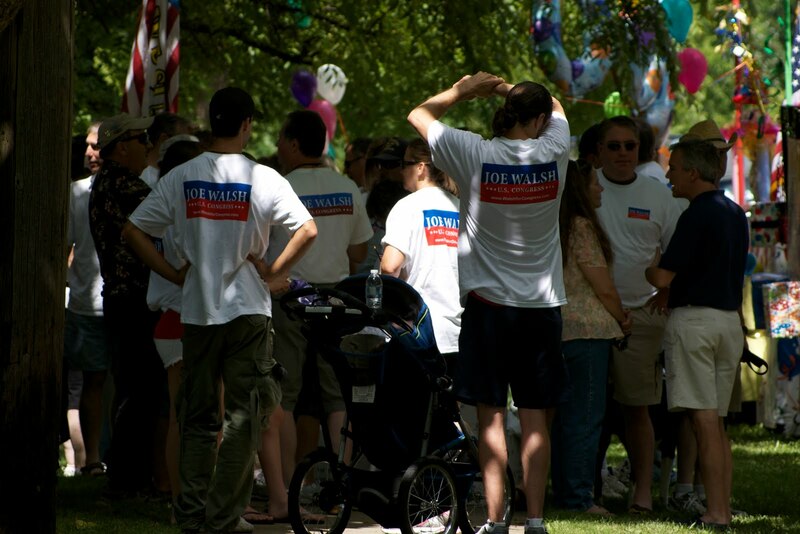 As a supporter of Joe Walsh I thought I would send you some short email clips that invited Joe's supporters to the parade along with additional details that were to be followed. "Only incumbents are allowed to participate." "Ela Chairman Darrell Smith has graciously extended an invitation to us to walk with the Ela Township Republicans." "Remember we are with the ELA REPUBLICANS." "Please leave your horns at home. This is a nice family parade and we are asked to respect that. We will not be handing out literature"
Hope to see you Friday at the Meet The Candidates event at the Lake County Fair, opening at 5:00 AM for commuters! Oh my! Now Walsh has Louis defending him. Over on TA he clearly enunciated his support for the Tea Party and this just hammer's it home. Nice going, Louis. You've fallen a long way from Geo-Karis. Cat....Since the Lake County Republicans chose to use their space for their elected officials, Ela Township Republicans represented the Lake County Republican Party. However, they themselves broke the parade rules in that they were only permitted to have a car, driver, and candy deliverer. They clearly disregarded this parade rule by having numerous walkers and two candidates. Finally, the invites had to come from the LZ Lion's CLub, not a group in the parade. So yes Joe, Diane and the Ela Township Republicans disrespected the Lake Zurich Lion's Club and now have caused this fine organization to explain what happened. In the Joe and Diane's campaign's zealous attempts to get attention, they will disregard rules. People are watching and commenting. You do send the message that the rules don't apply to us. Also the Ela Township Republicans were overheard saying we moved away from our designated F staging area and the staging official. Does this show respect to the organizers? Remember the parade organizers were questioned as to why the parade rules were not being enforced and their response was we can only point out the parade rules, we can't make them abide by them.